Healthcare practices can drive higher patient acquisition from the Internet if they can ensure their practice appears on the first page of Google search results. While this statement is true, it doesn't always guarantee the expected results. After all, how many users/patients do you think will check every link on the search results page before selecting a provider? To get patients to click on your practice's link before any other, you'll either need to acquire the top position (at least within the top five), or present something more 'catchy'. That's where Google review snippets come into the picture. One of the best ways to improve click-through-rate (CTR; the percentage of users who clicked on the link to come to your web page) for your site on Google, without even ranking in the top 3 or top 5 of the search results, is the Google review snippets. [Remember those graphical star ratings appearing below the site link for search results on Google.] [Review snippet of one of our highly esteemed healthcare clients] These review snippets provide a more reliable picture and are also eye-catching, which makes users click on the link, even by ignoring the links appearing above it in the search results. Not only could this equate to more new customers, but it could also increase your web page's CTR, helping it to rank higher for relevant keyword searches in the future. 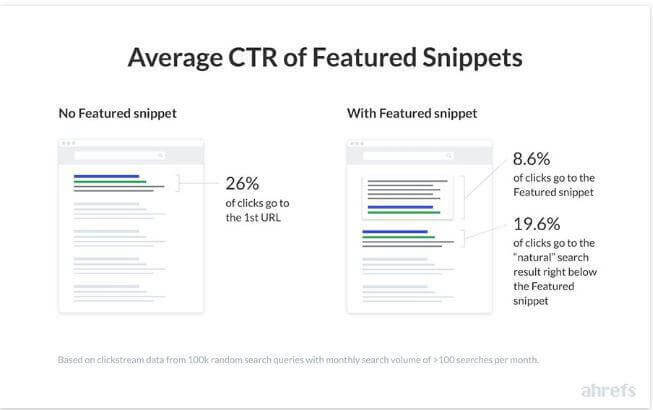 The first organic result shows a significant drop in click-through-rate when a featured snippet is present, according to a study by Ahref. Step 1: Create a testimonial page, if there is none, and fill it with patient reviews. Avoid borrowing reviews from third-party review sites like Yelp, Google, HealthGrades, etc. That practice isn't recommended! You can utilize RepuGen for getting consistent reviews from your patients. Step 2: Next, mark up each review with review schema. Google recommends using JSON LD for this. Depending upon your service or specialty, wrap the reviews with the relevant schema. For example, physician schema for physicians, dental schema for dental practices, and medical organization schema for hospitals. Also, include the aggregateRating with the average of all the reviews on the page. Step 3: Then, add the markup to your website's <head>. Step 4: Add your specific schema (dental, physician, or medical organization) and aggregateRating schema to other relevant pages on your site. For medical practices, it should be the specific service pages or the location page (but usually location pages do not contain testimonials). Note: Don't forget to check for errors. Use Google's own structured Markup Data Testing tool for identifying errors. Fix the errors to help Google read your schema implementation easier. The XYZ location page should show review stars in search results because you marked up XYZ patient testimonials on that page, and so on.